One-to-one or why not share with a friend? A tailor-made class providing a great way to make quick progress. Minimum 1 hour, with prices from just £22 per session. Please contact us for details, or to arrange a booking. 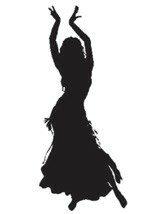 Guest teachers specialising in Turkish and Persian Dance are available, plus other visiting teachers. See Calendar page for upcoming events. Have fun and feel beautiful. Gather all you Hens for a unique chance to learn this ancient and exotic form of dance. Experience the ultimate expression of femininity to complete your pre-nuptial celebrations. Work through basic technique and learn to recognise the connection between the music and the different movements obtained by the body. Finally combine all the movements together into a simple choreography. The event lasts approximately 1.5 hours. The event lasts approximately 1 hour. These event lasts a minimum of 2 hours. Carmen collaborates with Chas Whitaker and Maren Lueg to bring an exciting variety of workshops combining live music and dance. Prices for all workshops are variable. For details or bookings, please contact us.